Experience earlier Master Class Series 1 thru 8 with Gene Ang and the Arcturian Healing Frequencies. 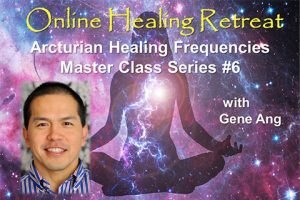 Enjoy over 48 hours of Arcturian Healing Frequencies in this Online Healing Retreat Master Class series recorded and encoded with Healing Frequencies. Each series has three 2-hour episodes in MP3 audio downloads, plus, each of the Healing Frequency sessions within the audio programs have been edited into Healing Frequency segments so you can return to these Healing Frequencies and enjoy the specific session you want, without the discussion in between Healing Segments. Review the Master Classes below and Experience the Diversity of How these frequencies can amplify your intentions and manifesting abilities, as well as heal the physical body. 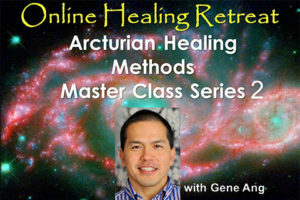 This original Online Healing Retreat is 2 hours long and it introduces you to the Arcturian Healing Method via Gene Ang in a pre-recorded group session. This contains the Arcturian Blueprint Activation of the Adam Kadmon image so the Divine Self can physicalize in all dimensions, plus the Arcturian Regeneration of Cells and DNA, And the Arcturian Dimensional Bridge. The Arcturian Blueprint Activation – experience a frequency that allows you to align more closely to your divine Blueprint, or your Adam Kadmon image. The Arcturian Regeneration of Cells Activation – experience a frequency to heal the body of phsycial symptoms at the cellular and DNA level. The Arcturian Dimensional Bridge, this frequency helps to merge whatever dimension you are in with the Arcturian Dimension so you can receive energy for any place that needs assistance. In this on-line healing retreat we will discuss the importance and relevance of thought forms. What they are? How they influence us and others? And how we can extract strong crystallized thought forms from our energy field and consciousness? Then we will experience an in-depth energy treatment using various Arcturian Healing Method frequencies meant to extract unwanted and unhelpful thought forms. This will include Arcturian Blueprint Activation (ABA) as well as the crystallized thought form extraction protocol [Arcturian Freeze Frequency (AFF), Arcturian Extraction Frequency (AEF), and Arcturian Restore Frequence (ARF)]. In this on-line healing retreat, we will be addressing emotional wounds or scars that can be held from lifetime to lifetime. Sometimes referred to as samskaras in ancient Vedic yoga literature, these emotional scars can influence us without our conscious awareness. This will be the first time that the Arcturian Healing Method Level 5 frequencies coming from the Arcturian/Metatron devices will be used in a group setting. There is a particular frequency coming from both the Arcturians and Metatron, the Angelic being, that can efficiently extract and release these emotional wounds and scars. This can be life altering and life changing. We continue with day 3 of the on-line healing retreat by utilizing a different Arcturian/Metatron frequency meant to adjust or change our current timeline towards one that is more optimal. Our future is constantly changing depending on possible timelines which we can choose either to manifest or keep in potential. Certain nodal points in our life allow for rapid acceleration of our evolution and consciousness because they allow for a change onto a more optimal timeline. When this Causal Arcturian/Metatron (CAM) frequency is channeled on to a person it either stabilizes an existing timeline that is beneficial or creates a nodal point to allow the person to switch to a more beneficial and prosperous timeline. This Master Series is the 4th series with the Arcturian Healing Frequencies. Our earlier Master Class Series 1, 2 & 3 are part of the package options below and can be experienced in any order. Learn 10 Quantum Holographic Healing Techniques in two sessions spanning 4 hours! This class will contain 10 important concepts in energy medicine integrating concepts of quantum mechanics as applied to healing and transformation. Put the techniques you’ve learned in Session 1 and 2 to work in changing reality! This is a popular course by Gene Ang, who teaches you how to bend spoons using 6 different techniques based on quantum mechanics and torsion field physics. So why hold a spoon bending class? It is not only about bending spoons! The change in material reality demonstrated by the bent utensil is a model for change. The mechanisms used are all known healing techniques. Experience how to use these techniques in your own life for personal growth and transformation. Bring some simple utensils for this session and put your skills into action! The Arcturian Mer-Ka-Ba transmissions are meant to activate your 5 vehicles of consciousness with love. This activates and coordinates your consciousness to receive light and information from higher worlds and muliti-dimensional planes of reality and existence. The Mer-Ka-Ba is known as a vehicle of consciousness or chariot which can allow the spiritual practitioner the ability to journey into the other planes of existence. Mer means love. Ka means the etheric body (pranic body). Ba means the astral body. When the etheric body and astral body are infused with Love from the Divine then the person can travel in the inner worlds. This series of 3 transmissions will utilize a special Arcturian Blue and Purple Sapphire Jewel that will be energetically encoded into each participants heart area. This Arcturian Mer-Ka-Ba Jewel will then infuse all 5 consciousness vehicles (physical, etheric, astral, causal, and spiritual) with Divine Love. After completion of the 3 transmissions, participants will have greater capacity to travel in the inner world, hear the inner voice from their Higher Self, connect more strongly with Higher Beings and their Guides, and receive packed information (downloads and uploads) communicated between themselves and spiritual beings. In addition, participants will develop their compassion and desire and ability for selfless service for all sentient beings. Transmission 1 (day 1): Encodes the Arcturian Mer-Ka-Ba Jewel in your heart and begins the process of love infusion into the physical and etheric body. Transmission 2 (day 2): Further activation of the light infusion into the astral and causal bodies. Transmission 3 (day 3): Complete activation of the spiritual body and coordination among all five bodies with inner world flight and communication. 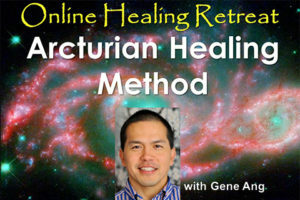 Each day of the on-line healing retreat will consist of use of the Arcturian Healing Method Frequencies to prepare the subtle bodies to receive the transmission, the transmission itself, followed by Arcturian Healing Method Frequencies to integrate the transmission. There will be time for questions, answers, and discussion after each energy session. 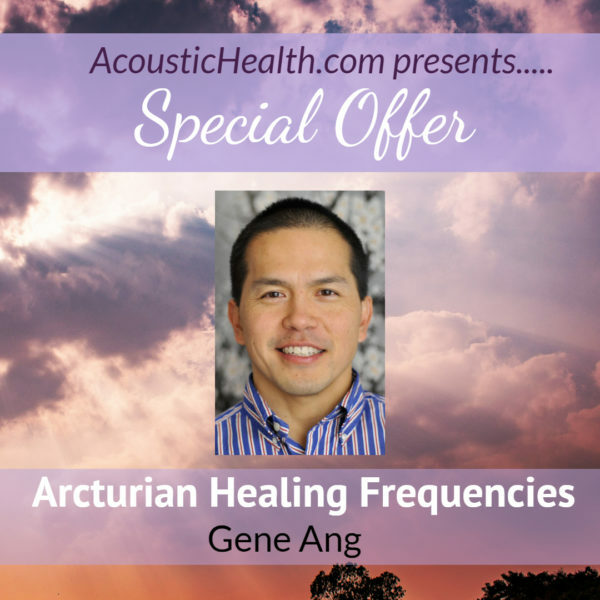 EXPERIENCE 8 ADDITIONAL MASTER CLASS SERIES WITH GENE ANG AND THE ARCTURIAN HEALING FREQUENCIES. Learn over 10 techniques to make metal soft demonstrating to yourself that there is more to physical reality than meets the eye. Also the book covers in-depth the application of the techniques to healing and other aspects of transformation in your life. Learn to bend spoons using 6 different techniques based on quantum mechanics and torsion field physics. So why hold a spoon bending class? It is not only about bending spoons! The change in material reality demonstrated by the bent utensil is a model for change. The mechanisms used are all known healing techniques. Experience how to use these techniques in your own life for personal growth and transformation. This evening seminar is an in-depth study and practice utilizing and integrating the 3 chakras above the body and 3 chakras below the body with the entire energy field. The seminar starts by understanding the structure and function of these transpersonal energy centers and how they relate to the energy centers found within the physical body. Next we will learn an advanced energy practices that utilize these transpersonal chakras: the Vesica Piscis Meditation. The Vesica Piscis Meditation coordinates the activation of the 3 upper transpersonal chakras with the 3 lower transpersonal chakras. This allows for a balanced development of the energy field both above and below the energy body. This meditation further builds the sacred geometrical form of the vesica piscis into the energy field which acts as an inter-dimensional gateway for meditation and consciousness travel in the inner worlds. The third part of the seminar is a discussion of the high frequency light and information called the Arcturian Dimensional Bridge (ADB). This healing energy is taught and transmitted in level 3 of the Arcturian Healing Method. The Arcturian Dimensional Bridge fully brings in the trans-dimensional space of consciousness and energy referred to as the Arcturian dimension into the dimension where the healing is taking place. This allows for rapid transformations in consciousness and energy for participants. In this video, participants will receive a full group healing (45 minutes) using the Arcturian Dimensional Bridge in which they can work on an issue on any level (physical, energetic, emotional, mental, and/or spiritual). Quantum Physics states that all things are arising out of the quantum void. This quantum void or zero point energy contains all possible outcomes and infinite potential. However, as soon as consciousness views a particular outcome then all these infinite possibilities collapse into that particular case. In Quantum Physics terms this is called collapsing the wave function. Is it possible to go beyond this? Is it possible to go in the reverse direction? Any particular situation like a health condition or problem is similar to having the infinite possibilities of the quantum void collapsed into a particular wave function or condition. Is it possible to uncollapse that particular wave function and revert back to the infinite possibilities again? If so, this would allow for change on an enormous level. In this video we go through these possibilities in the context of healing and transformation and look at practical techniques to allow you to uncollapse events and allow for unlimited possibilities in your life and the life of others. We will go through various attitudes and states of consciousness that allow for this to happen and also areas in the energy body that used as a focal point can allow for this infinite change. You will go away with both a theoretical understanding of this phenomenon as well as practical techniques. This is a recording of the classes, discussions, meditations, and activations done during the 5-day Mt. Shasta retreat. The topic of the retreat focused on bringing forth the best in you in a way never before imagined. We utilized a multi-dimensional 7 Planes of Nature Model to explain the current human and what an acceleration of evolution in consciousness would look like now. These recordings allow you to participate in the information field of the class, learn the material and practices during the retreat, and experience the energy of 5 transmissions done at Mt. Shasta. This package includes over 10 hours of discussion and talks and 4 hours of energy transmissions and meditations. 1 unique transmission include in the 5 above that is guided by Metatron energy and consciousness. An in-depth discussion of spiritual gifts or spiritual powers (siddhis) and how to develop them in your spiritual practice. A discussion on which areas of your human energy field develop your spiritual gifts. The energy transmissions can be used to actively meditate and develop your subtle bodies and spiritual gifts. Gene guides you in the practice in each transmission. A dynamic breathing practice that allows you to quickly build your etheric body and physical vitality. A lecture on how to conduct Extraterrestrial Contact at Mt. Shasta and other related sacred sites. If you want to experience the energy and information of Mt. Shasta, this package is exactly for you. To order click the link below .You will be immediately sent download instructions for all the mp3s. 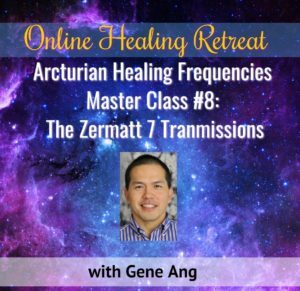 In this Online Healing Retreat (OHR) we will be focusing on using a whole new array of Arcturian Healing Method Frequencies just starting to materialize on the planet. This series of frequencies, the Arcturian Upper Echelon Frequencies, is the next level of frequencies in the Arcturian Healing Method. The purpose of this OHR is to systematically expose you to the entire range of the Arcturian Upper Echelon Frequencies three times. Each session will raise your vibration to a new level. After three sessions, you will have experienced the full range of Upper Echelon Frequencies in three subsequent deepening and heightening ways. In each session, we will first prepare our subtle bodies and consciousness using previously used and downloaded Arcturian Healing Method Frequencies. Then we will go through in a systematic way the use of Upper Echelon Frequency 6, 7, 8, 9, 10, and 11. These are the six Upper Echelon Frequencies currently downloading onto the planet now. Each frequency takes your current state of consciousness and vibration and raises it to the next level. In total by the end of the session, your frequency and vibration will be raised 6 times. Because we will be doing this three times in total (3 sessions), your vibration will be raised a total of 18 times which in numerology would equate to the number 9 (1+8=9). The number 9 is a number of completion. To conclude each session, we will use Arcturian Healing Method Frequencies to integrate and materialize the changes that have occurred in your system. To help us be of greater service. To bring to our full awareness this relative reality and its dreamlike nature. To bring to our awareness our true nature beyond space and time. During this 3 session Online Healing Retreat, we will be experiencing and utilizing the Arcturian 5 Platonic Solids Healing Frequencies to aid in our powers of manifestation. Each of the three days will be dedicated to infusing our subtle bodies with each of the Arcturian 5 Platonic Solids Healing Frequencies. This is the first time we will be utilizing these frequencies in a public setting. Session 1 : we will be using the Arcturian Tetrahedral Fire Frequency and the Arcturian Icosahedral Air Frequency. After each session with the healing energies we will discuss the basis of utilizing these shapes, elements, and frequencies in manifesting our thought forms into physical reality. Session 2: continues our journey by utilizing and exposing our Fields to the Arcturian Octahedral Water Frequency and the Arcturian Cube Earth Frequency. Here we continue the densification of the fine matter of thought into the densified matter of the physical plane. We will also discuss the mysteries of the water and earth element and their corresponding Platonic shapes. Session 3: concludes with the Arcturian Dodecahedral Etheric Frequency. Perhaps the ultimate Platonic Solid and Element, the Dodecahedral shape and frequency embodies all the other shapes and elements and signifies the use of the etheric dimension. We will imbue our subtle bodies and consciousness with the Arcturian Dodecahedral Etheric Frequency and then discuss the use of this shape in manifesting from the spiritual realms into the physical realm. The Arcturian Tetrahedral Fire Frequency- utilize the warmth ether in your creations. The Arcturian Icosahedral Air Frequency- utilize the light ether in your manifesting abilities. The Arcturian Octahedral Water Freqency- utilize the chemical ether in densifying your thought forms. The Arcturian Cube Earth Frequency- finally manifest through the life ether into the physical plane. Also included in the three days will be a discussion of the Fifth Moral Ether and the Physic of the Etheric as espoused by Rudolf Steiner in explaining how cycles of creation and the densification of spiritual thought processes into the physical domain occur. If you want an energy tool to aid in your manifestation work not commonly available at this point in time. If you want to deepen your understanding of the processes of creation. If you want to begin working with sacred geometry from the Arcturian perspective. If you want to heal aspects of your life from an intentional and thought form point of view. There are three Solar Logos transmissions meant to fully prepare us for this time of initiation during the month of December. The first transmission is called the Clearing of Obstacles and is meant to help cleanse all the subtle bodies (physical, etheric, emotional, mental, causal, spiritual, and divine) of traumas incurred in this life as well as past lives. This helps us to be able to fully receive the divine energies and frequencies in transmission 2 and 3. The second transmission is called the Chalice of the Heart. In this transmission, the Solar Logos energies and consciousness will further open the 6 out of the 12 petals in the heart chakra. The framework we are using here is that the heart chakra contains 12 lotus petals. So far in humanity 6 of these petals or sections are already open. The work of humanity is to open the remaining 6. This transmission accelerates and aids the development of each person to further open fully these remaining 6 lotus petals of the heart. The third transmission is a culmination transmission called the Christic Coordination. In this transmission the heart center; the center for feeling and compassion, is coordinated with the head center; the center for intelligence and clairvoyance, and the belly center; the center for will and action. All 3 centers are then coordinated and connected to the first chakra above the head which is the center for our incarnated soul or Higher Self. The first chakra above the head is also the communication point for the conversation or connection with our Holy Guardian Angel. From this first center above the head we are further able to communicate with our other Guides and Higher Beings of the Spiritual Hierarchy. These include the Angels, Archangels, Archai, Elohim, Dynamis, Kyriotetes, Thrones, Cherubim, and Seraphim. This series of transmission is meant to fully connect us to our Higher Self so that we can be of greater service to other people, other beings, and the planet. I will gain access to everything! All Online Healing Retreat Master Classes Plus Into and the Super Quantum Healing Package!